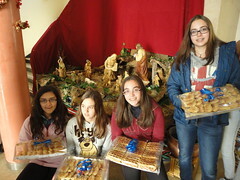 During the weekend break of the Solemnity of the Immaculate Conception, we had a get-together for girls 13 years and up in the Shrine of "Nuestra Señora del Águila" in Alcalá de Guadaíra, Seville. 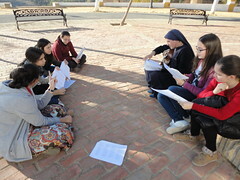 The girls arrived around 11:00 a.m. on the 6th, and when the late-sleepers still had not arrived, we began our get-together with a time of prayer in the chapel. After filling our hearts we had to fill our stomach, so we all got to work.... pealing potatoes! The best part was seeing the different ways of doing it. It was a miracle was that no finger was cut off! In the end, we made some great-tasting spanish potato omelettes and enjoyed the food with good conversation. After we finished lunch and cleaned up, we had half an hour to practice Christmas carols. Pretty voices? It's the thought that counts! After all this, we began our craft: a boot with an image of the Holy Family so that afterwards they could give joy to someone by giving it full of candy and sweets... There was a very good atmosphere among the girls. Before finishing the craft we watched the first part of one of the programs of "It can happen to you", about the conversion of Paul Ponce, an incredible juggler. Everyone was impressed by his approach to courtship, marriage and of how he was able to combine his wandering life, from one country to another, from one performance to another, with his life of piety. 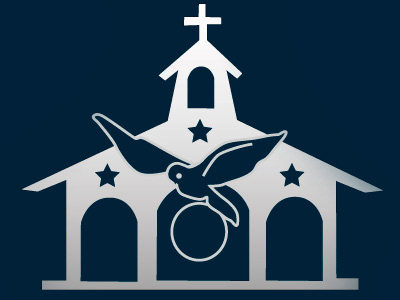 Prayer, daily mass... You have to see it! You will be impressed by how God works in souls. After the video discussion, we got to work again. What was our mission? To make waffles. Yes, you read it right. 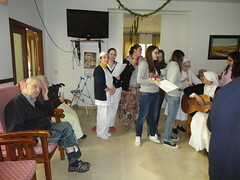 We heated up the waffle makers and made waffles non-stop until it was time for mass to be able to take them the following day to the elderly in the nursing home run by the Daughters of Charity . 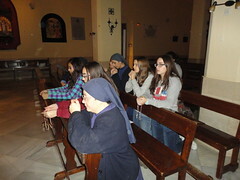 Around 7:15 p.m. we all went to mass in the parish of Santiago, praying the rosary on the way. When we got back home after mass, some continued with the waffles, while others made supper and set the table. We ate pizzas for supper, played for a time in the field next to the Shrine and, to finish off the day, one of the sisters gave a "good night talk" in the chapel, like St. John Bosco did with his boys. The time came to go to sleep, but as sleep did not come, we helped it by watching a movie. The sun rose on the 7th, and it was time to get up. We went to mass at 9:00 with the Daughters of Charity, and we rewarded the tremendous effort of waking up early with nothing less than "churros" (spanish funnel cakes) with chocolate. After silencing our stomachs, the girls had time for prayer. A sister gave points of meditation. At 11:00, with 4 platters full of waffles, we went to the nursing home to give them to the elderly and cheer them up by singing them some Christmas carols. From there we went to visit a 92-year-old woman who lives alone, although her nieces take very good care of her. After a very pleasant conversation, she gave the following advice to the girls: "You have to have fun, since you are at that age, but in a holy way. Do not ever forget that the Blessed Virgin is always watching you and, keeping that in mind, you will avoid doing things that do not please her". Back at home, we prepared dinner. 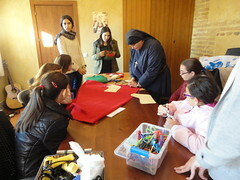 After eating, we had a meeting about spiritual direction and later we continued with the boot craft. At 6:00 we prayed the rosary together in the Shrine, and to finish, the girls had the opportunity to approach the altar where the statue of the Blessed Virgin is, with an empty manger and a basket of "resolutions" of good works for advent. One by one they went up, offered in silence something personal to Our Lady, and picked out a resolution. They all left very happy, since they had made a big effort to overcome themselves and create a good environment. With their hearts full of love for Our Mother, they hope that very soon there may be another get-together, and a boot full of candy. If you would like to come, you are invited to the next one. We hope to see you!